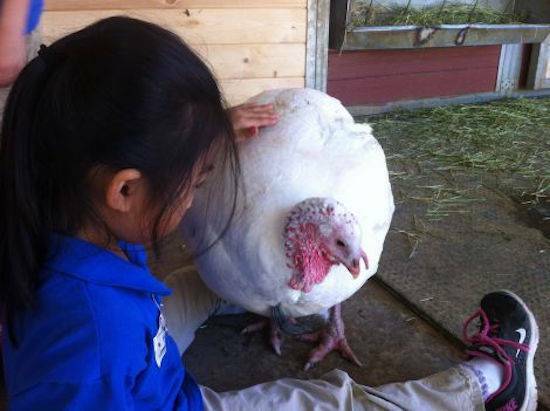 Rescued turkey Chloe cuddled with thousands of guests and opened thousands of hearts. She forgave humans, found joy in each moment, loved with her whole heart, and healed all of us. Every turkey eaten on Thanksgiving has the same intelligence and affection as Chloe, and could have been an angel, if only given the chance. Several years ago we had a turkey named Chloe who we had rescued from Thanksgiving. Her toes and beak had been cut off with a hot blade, and she was filthy dirty. When she came in, she was very angry. We thought that she would hate people her whole life. However, to our surprise after four weeks of being at The Gentle Barn, she climbed into our laps and fell asleep. She was our hero and a role model of forgiveness to the kids we worked with. One day we had a booth at a fair, and we took Chloe with us. Throughout the years we had Chloe, she had done many fairs with us. She always sat quietly on the grass as we set up our tables and tents. When the kids arrived, she did her job of allowing them to pet her and hold her. On this particular day, we were situated about fifty yards from the stage, which was also being set up this whole time. The music started playing and all of a sudden Chloe sprang to her feet and started running towards the musicians. She stood right in front of the band and started swaying back and forth to the music. We had people at our booth, and she was supposed to be working with the children, so I ushered her back to our area. The minute I turned my back on her, she ran back to the stage. This continued a couple more times until I finally gave up. I sat in the front row and watched my turkey dance and sway, with her eyes closed, almost in a trance. There were lots of people dancing around her, and she just joined in. We stayed there like that for three hours until the band finally took a lunch break. The minute the music stopped, Chloe opened her eyes and walked herself back to our booth. I could not believe my eyes! When we came home from the event, after seeing how important music was to Chloe, we had a radio set up in the barn. From then on, where the radio was, was where you could find Chloe, eyes half closed, swaying to the rhythm. A few months later, we hosted a special needs classroom at The Gentle Barn where we met Julia. Julia was born to sing. She sang and twirled like a ballerina from the time she could walk even though she was blind. She had a joy about her that lit up the world. When she was four years old, the big earthquake that shook Los Angeles rocked her world. I guess being blind and helpless traumatized her more than we could imagine, and she refused to speak ever since. She also had huge temper tantrums at home and at school, scratching, biting, and kicking anyone nearby. Julia was sixteen-years-old when I met her. The kids were all holding the chickens and petting the animals. When I approached Julia with a red hen named Bonnie, the teachers yelled at me to stop. They explained that Julia was not safe for the hen because she was prone to violence. I looked over at Julia and her sweet face. She did not seem like a threat to me, and I wanted to give her a chance. At The Gentle Barn, every animal and person who comes out to visit gets to decide who they want to be; not who they were yesterday, not based on what people say about them, but who they decide in that moment. I wanted Julia to have the same opportunity that day. The teachers kept advising against it, but I insisted on taking the risk, and they finally relented. When I placed Bonnie in Julia’s arms, a smile spread across her face like a sunrise. She stroked the chicken for hours, not wanting to put her down. She was gentle and kind the whole time; she treated the hen like a precious china doll. Each month Julia looking forward to coming to The Gentle Barn and would smile the minute the bus doors opened, and she heard the roosters’ crow. In the two years that Julia was part of our program, she hugged the cows, held the chickens, fed the horses and was never, ever violent or angry. Her teachers were amazed because The Gentle Barn was the only place she was always happy. It became my mission in life to help Julia speak. I remembered that Julia loved to sing and dance, and so did my turkey Chloe. So, I started sitting with Julia while holding Chloe. I told Julia that Chloe loved music and it was important that we sing to her. I would sing softly while Julia pet Chloe. Every time Julia came to the barn, we repeated this process until one day Julia hummed along. It was under her breath, almost inaudible, but there just the same. Over the next several months, Julia hummed louder and louder until one day she was fully singing by my side while we both stroked Chloe. Eventually, singing turned into talking. By the time Julia graduated our program, she was fully vocal! When Chloe passed away, there was a rainbow that shined across the sky that day, and it wasn’t even raining. Now, every time I see a rainbow, I think of Chloe and all the amazing things she accomplished in her life here with us. She cuddled with thousands of guests and opened thousands of hearts. She forgave humans, found joy in each moment, loved with her whole heart, and healed all of us. Every turkey eaten on Thanksgiving has the same intelligence and affection as Chloe, and could have been an angel, if only given the chance.